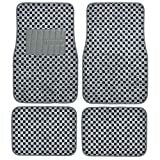 Checker Floor Mats with 550gr of woven carpet material. Improve the look of your car interior in minutes. Equipped with non-slip nibbed rubber backing. Easy clean up and installation. Great for protecting your car flooring.